The advancement of dental materials and bonding techniques have allowed us to offer patients restorations that we could not reliably offer in the past. Porcelain onlays are an example of that. A porcelain onlay is sometimes also referred to as a partial crown. It is a porcelain restoration that restores one or more of the cusps of the tooth but doesn’t cover the whole tooth like a crown. When one or more cusps of a tooth break, a filling is no longer sufficient to restore that tooth and protect it from fracture. Something stronger is needed. Traditionally, crowns have been done. While a crown is good treatment, it involves the removal of a lot of tooth structure. If only one or two cusps have broken, an onlay is usually better treatment because it preserves more of the tooth structure. It fits into the tooth like a puzzle piece and is bonded to the tooth. 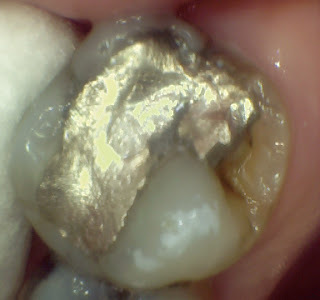 Many times patients will ask about replacing large silver fillings that are breaking down. In the past, the only esthetic options were a porcelain fused to metal or all porcelain crown, which require a lot of tooth removal. Of course, gold onlays are an excellent choice and have been around for a long time but they are usually rejected for esthetic reasons. A porcelain onlay allows us to provide a durable, esthetic option that will only require the removal of the old silver filling and any stained, decayed or fractured tooth structure. 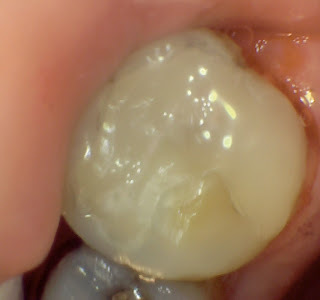 Often, a lot of tooth structure will be preserved, unlike a crown. This provides many advantages. Since much of the margin of the onlay is above the gums, it is easier to clean, leading to less decay and gum disease. Also, since less tooth structure is removed, there is a reduced chance of damaging the nerve which would require the need for a root canal. In addition, if any decay does develop around the onlay, it will usually be easier to detect and repair than it would be around a crown. Although onlays do have less retention than a crown, with good bonding and adjustment of the bite, they rarely come off or break. Overall, their advantages over a crown are many. If you should have the cusp of a tooth or a filling break, you should ask your dentist if a porcelain onlay is right for you.